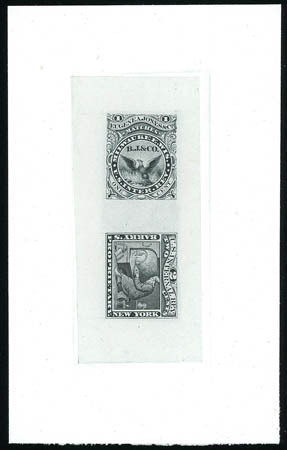 Barry's Proprietary, 2¢ black, compound trial color large die proof, in conjunction with Eugene Jones & Co. 1¢ B.J. & Co. Match essay, on India die sunk on card (119x74mm), bright and fresh, Very Fine and choice, a rare compound die proof of a issued Medicine and an unissued Match stamp. Scott No. RS29TC1 var. Estimate $300 - 400. 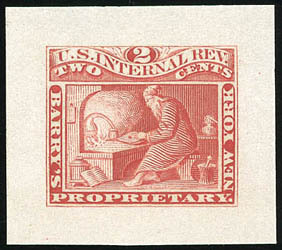 Barry's Proprietary, 2¢ trial color large die proofs, two in blue and red, on India, stamp size with wide even margins, fresh and pristine, Very Fine and choice. 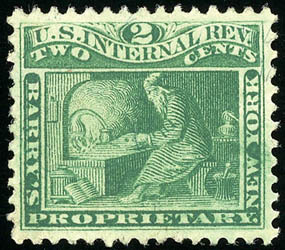 Barry's Proprietary, 2¢ green, silk paper, double transfer, showing in "Barry's" at left, exceptional centering, rich deep color, Extremely Fine and choice, a wonderful example of this scarce variety.